Red Clover is an herb that grows in meadows, and a close relative to the clover you may find in the front yard. The red flowers offer therapeutic potential, and are full of nutrients including calcium, phosphorus, potassium, niacin, magnesium, thiamine, chromium and vitamin C. Extracts of Red Clover may help to fight infection, suppress appetite, and have expectorant, antispasmodic, and relaxing effects. They are an excellent herb for bacterial infections, and inflamed lungs, and are also found to be beneficial for inflammatory bowel disorders, liver disease, kidney problems and skin disorders. Some studies suggest that the Red Clover isoflavones may slow bone loss and boost bone mineral density in pre-menopause and perimenopausal women. Red clover may also have blood thinning properties which improves blood flow and helps to prevent blood clots. When applied to the skin in an ointment it may help to treat eczema, psoriasis and skin rashes. The isoflavones found in the flowers are a rich source of phytoestrogens, which are water-soluble chemicals that act like estrogen in the body. Isoflavones also have strong antioxidant properties, and recent research has shown that it stimulates the immune system. And it has also been found that these isoflavones, might help to reduce the symptoms of menopause, such as hot flashes and night sweats. 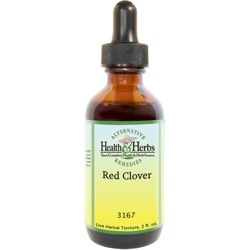 Red clover tinctures may also help protect against bone loss. Several studies of isoflavone extracts from Red Clover have shown that it may help to lower triglyceride levels in post-menopausal women. The use of Red Clover extracts as an herbal remedy goes back centuries, and the plant has a long history of both topical and internal applications. In topical applications, Red Clover is often used in liniments and balms, for relieving the pain of eczema and psoriasis, sores, burns and even as an aid against skin cancer. The pain-relieving properties of the herb are likely due to the presence of the anti-inflammatory compounds eugenol, salicylic acid and myricetin in the flowers. Red Clover has also been used as a "blood purifier" and has been included in traditional herbal formulas, including Essiac Tea, Hoxsey Formulas, and Jason Winters Tea. It is definitely a blood thinner due to its high concentration of coumarin. For cases of thrombosis, and other conditions caused by poor circulation and blood obstructions, the herb has been found to be very useful. However, this should never be taken before surgery or while taking blood-thinning medications, as it may cause the blood to become too thin. Nutrients: Calcium, iron, magnesium, manganese, niacin, potassium, phosphorus, selenium, silicon, zinc, vitamins A, B1, B2, B3, B5, and C.
Ingredients: Red Clover, Structured Water, 20% Alcohol. Non-Alcohol: Red Clover, Structured Water, Vegetable Glycerin. Contraindications: Currently, there are no known warnings or contraindications with the use of Red Clover; however, due to its coumarin content, the potential to enhance anticoagulant effects exists. Because Red Clover Red may have estrogenic activity, it should be avoided or used cautiously by patients with hormone-sensitive disease. Taking Red Clover and a contraceptive may cause the contraceptive not to work well. From Anonymous of richmond, Virginia on 4/18/2012 .